Additional days were added after unprecedented ticket sales. The once-in-a-never opportunities allow Norfolk & Western steam fans to experience the locomotives as passengers, engineers, firemen, and photographers. 611 Society Members enjoy advance ticket purchasing. 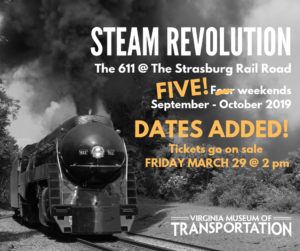 After record-breaking ticket sales, the Virginia Museum of Transportation, Inc., (Roanoke, VA) and the Strasburg Rail Road Company (Strasburg, PA) announces more opportunities to experience the iconic Norfolk & Western Class J 611 and the Norfolk & Western Class M #475 steam locomotives up close as passengers, engineers, firemen, and photographers. Members of Virginia Museum of Transportation’s (VMT) 611 Society enjoy advance ticket purchasing. The general public can purchase tickets beginning at 2 pm on Friday, March 29.